Check out how we increased natural daylight in this London property.. Situated close to the City of London, and surrounded by sleek architectural design, this young couple were keen to remodel their home. The installation of a Flushglaze frameless rooflight from Glazing Vision was crucial to unlocking the natural light in the windowless kitchen area, whilst maintaining the privacy required from the client. Dickson Architects were appointed to revamp this Victorian property in the Arlington Square conservation area in Islington, North London. With the client keen to transform their home and provide an open plan living/dining/kitchen at ground floor, while also remodelling their first floor to provide a generous master suite and library. Throughout the entire project, increasing the natural daylight levels was core to the clients brief. The existing ground floor lacked the required daylight for the client and the proposed design was created to inject much needed natural daylight into these spaces. Extending the rear closet wing to form a full width ground floor extension and provide a large open planned kitchen dining space, creating the a ‘wow factor’ room for the clients’ new home. Given the location close to the City of London, it was essential to ensure the design didn’t encroach on the privacy of the resident. With the ground floor plan being quite deep, the only way to get a decent level of natural daylight into the open plan kitchen/living space was to install a large roof light over the dining space. Helping to not only increase the levels of daylight entering the building but also, protecting the privacy of the client. 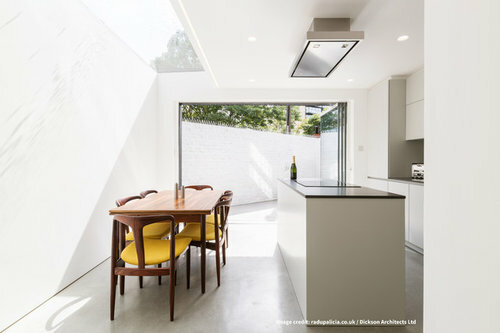 Dickson Architects chose the Glazing Vision fixed Flushglaze rooflight to flood the space with natural daylight. The addition of this 3550 x 1293mm frameless rooflight, helped to achieve the minimalist, contemporary look. The 32 mm double glazed unit, comprised of an 8mm clear heat soak tested toughened outer pane, 18mm argon filled warm edge spacer cavity and 6mm heat soak tested toughened Low E inner pane. This argon sealed layer improves the thermal and acoustic performance, both of which are important given the clients location. Key to providing a much-needed visual connection to the sky, the frameless rooflight achieved a clear view with no visible frames and fitted in with the design ethos for the extension. Providing the ‘wow factor’ for the dining area that the client was after and, helping to separate it from the rest of the kitchen. When supplying the roof light, there were a few manifestation details which needed to be discussed to ensure a smooth installation process and to protect the frameless view for the clients. As each junction varied, the rooflight was supplied with kerbs of different widths to accommodate the various abutment details on site – one side abutted to a brick wall; one abutted the top of a boundary wall; the others a newly formed roof kerb. Having used Glazing Vision previously, Paul Dickson, director of Dickson Architects, was aware of the technical knowledge she could utilise within Glazing Vision to ensure a smooth operation and produce the result that the client was after. “Our experience with Glazing Vision was once again very positive, and the person we dealt with during construction was very proactive and addressed any issues we had as and when they arose. We would highly recommend Glazing Vision for any scheme, especially in dealing with non-standard junction details which they dealt with as we needed them to, promptly and effectively, while considering the final aesthetic we wanted to achieve.”. Paul Dickson, Director of Dickson Architects. 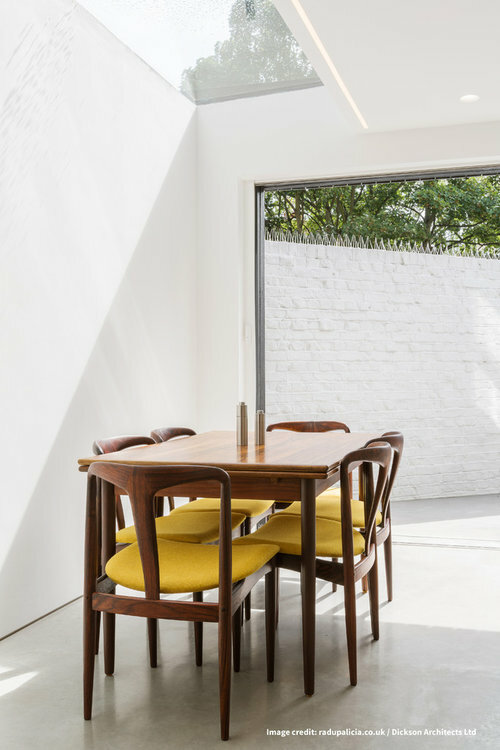 Dickson Architects design injected much needed natural daylight into the clients’ new home and has created not only a spacious kitchen dining area, but also one flooded with natural daylight. The sleek industrial palette included polished concrete floor to the extension and rear secluded courtyard, with neutral grey tones present throughout the extension. The extension is clad in Shou Sugi Ban black charred vertical timber boards. This charred texture of the cladding was chosen to complement the traditional London Stock brick on the rear façade. Emma Dickson explains that “the client is extremely happy with the end product, and especially with the amount of natural daylight that they can now enjoy in the space while dining”. To find out more about how Glazing Visions’ frameless rooflights can help to meet your requirements on your next project, contact us on 01379 658 300 or request a CPD. I definitely need more natural daylight in my home. Thanks for the tips!